The 2017 FIA World Rallycross Championship could not have been off to a better start from Audi and EKS’s point of view. The season opener at the Circuit de Barcelona-Catalunya saw Mattias Ekström triumph. In the final, the reigning world champion relegated Timo Scheider (D) and Andreas Bakkerud (N) to positions two and three. This victory immediately puts Ekström back at top of the drivers’ standings. In the teams’ classification, team world champions EKS are in the top spot tied on points with Team PSRX Volkswagen Sweden. The start to the season’s first race weekend had ups and downs in store for Ekström and his teammates, Toomas Heikkinen (FIN) and Reinis Nitišs (LV). “Saturday was incredibly difficult,” says Ekström. “The weather situation kept changing – sun, rain, sun, rain … In rallycross with its many single races, that’s extremely complicated – at one time you have an advantage and others a disadvantage.” Ekström caught a rain shower in his second race and at the end of day one was only in position eleven of the overall classification. Heikkinen had better luck. The Finn did the best job of coping with the changeable conditions and was leading after day one. 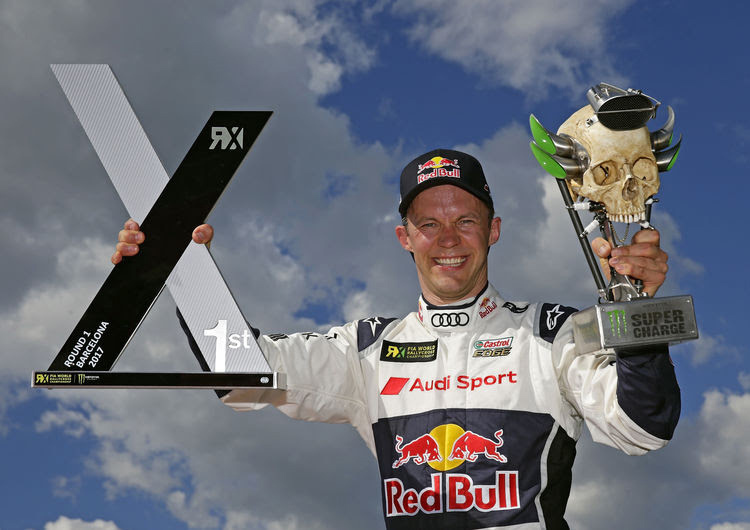 EKS will be traveling from Barcelona some 1,000 kilometers to Montalegre in Portugal to prepare for round 2 of the World Rallycross Championship on April 21–23. Ekström still has a score to settle with the shortest track on the calendar. Last year, following a collision in the semi-final, the 38-year-old had to bury his hopes for victory early.